A massive winter storm roared into the East Coast on Thursday, dumping as much as 17 inches of snow in some areas and unleashing hurricane-force winds and flooding that closed schools and offices and halted transportation systems. Blizzard warnings and states of emergency were in wide effect, and wind gusts hit more than 70 mph (113 kph) in some places. Parts of New England had already seen more than a foot of snow as it continued to fall into Thursday evening. 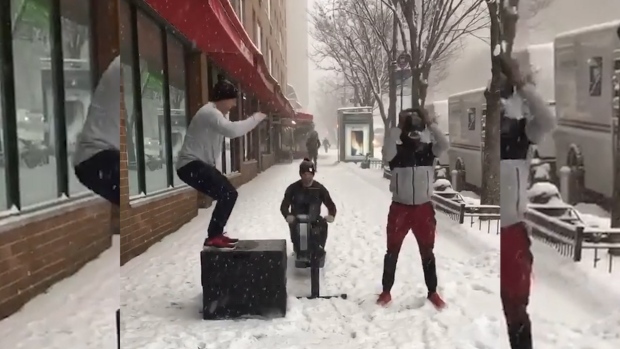 Check out some of the best videos New Yorkers posted to social media from the middle of a strong winter storm. In Manchester, New Hampshire, a woman lost control of her car and barreled into the hallway of a nursing home, necn reported. Despite the crash, no one was injured, fire officials said. 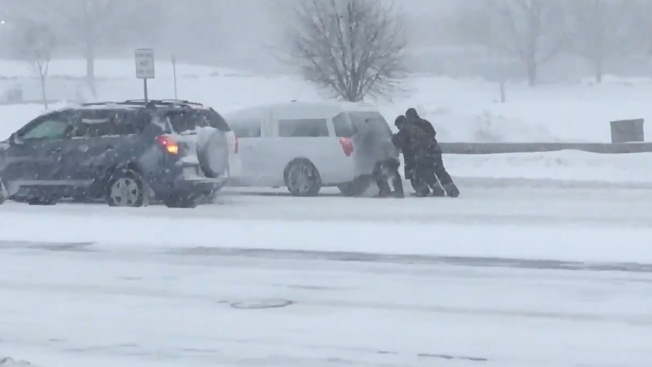 Orlando Igmat's car got stuck in a New Jersey snowbank along the Garden State Parkway in Tinton Falls as he drove to work at Verizon. He waited a half hour for a tow truck to pull him out. 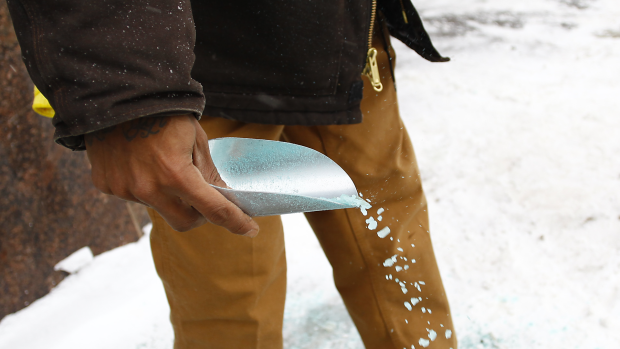 Before 11 a.m., 159 crashes had been reported on New Jersey roads, state police there said. New Jersey State Police were called 285 times to help motorists, NBC10 reported. 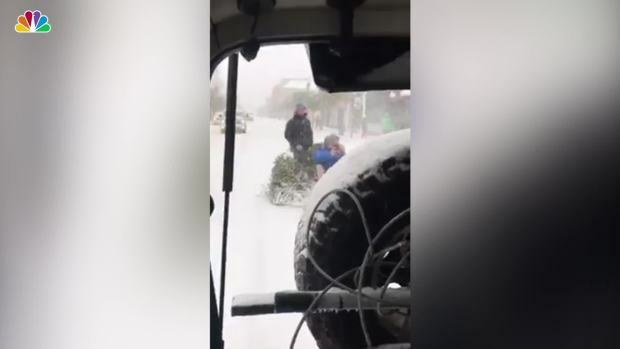 Some ingenuitive people in snowstorm-hit South Carolina decided to pull a Christmas tree behind a vehicle as a sled. Don’t try this at home. The high winds caused coastal flooding from Massachusetts to Maine, and the rising waters stranded people in homes and cars. The high tide in Portland, Maine, reached 13.79 feet, nearly matching the 14.17 feet reported during the Blizzard of 1978. In Boston, the harbor side entrance at the MBTA's Aquarium Station was temporarily closed. Video showed water flowing down the stairs like a river into the subway station, NBC Boston reported. South of the city, multiple cars were reportedly stuck in flood waters along Newport Avenue Extension in Quincy ahead of high tide. About 20 people had to be rescued. "The city has been hit very hard," Quincy Mayor Thomas Koch said. More than two-thirds of flights in and out of New York City and Boston airports were canceled. The flight-tracking site FlightAware reported more than 4,000 canceled flights across the United States. Mark Schoenenberger, a 45-year-old NASA engineer who lives in Norfolk, Virginia, put on his cross-country skis so he could make a half hour trip to the bagel shop for some breakfast for his family. The massive storm began two days ago in the Gulf of Mexico and first struck the Florida Panhandle. Some meteorologists described it as a "bomb cyclone" for the process of bombogensis, when the barometric pressure drops steeply in a short period.